The Value mattress protector protects against stains and wear and tear both of which prolong the lif.. The Essential Mattress Protector protects against stains and wear and tear both of which prolong the.. The Protect-A-Bed Premium Mattress Protector is made from a cool Terry Towelling which provides cush.. The Protect-A-Bed Cotton Mattress Protector is perfect for allergy sufferers, providing a dust mite .. 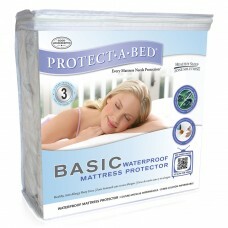 The Protect-A-Bed Plush cooling mattress protector features a soft and luxurious velour surface. It.. The Protect-A-Bed Aller Zip Smooth Mattress Encasement is the gold standard in mattress protection a..